Among the filmmaker iconoclasts who have influenced many a film and visual artist, one of the least heralded in their native United States are re the identical twins known as the Quay Brothers. All that is hopefully about to change as New York’s prestigious Museum of Modern Art opens Prescription for Deciphering the Quay Brothers, a gallery exhibition and accompanying film retrospective which will be the first presentation of the Quay Brothers’ work in all their fields of creative activity. The exhibition opened this past weekend and continues through the end of the year. 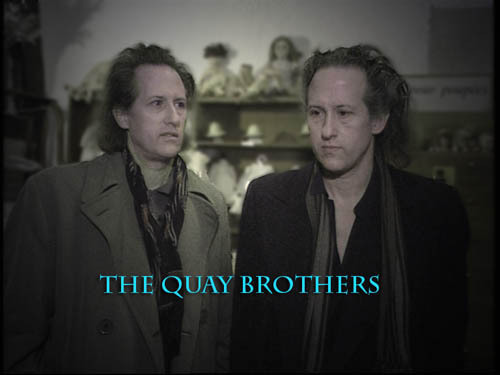 Born in the suburbs of Philadelphia, the Quay Brothers reside and work in England, having moved there in 1969 to study at the Royal College of Art in London. Starting off as painters and illustrators, they drifted into the world of experimental film, forming Koninck Studios in 1980, based in the trendy neighborhood of Southwark in South London. For over 30 years, they have been in the avant-garde of stop-motion puppet animation and live-action movie-making, drawing influence from the Eastern European tradition of filmmakers like Walerian Borowczyk and Jan Svankmajer. Most of their animation films feature puppets made of doll parts and other organic and inorganic materials, often partially disassembled, in a dark, moody atmosphere. Perhaps their best known work is STREET OF CROCODILES, based on the short novel of the same name by the Polish author and artist Bruno Schulz. With very few exceptions, their films have no meaningful spoken dialogue—most have no spoken content at all, while some, like THE COMB (1990) include multilingual background gibberish that is not supposed to be coherently understood. Accordingly, their films are highly reliant on their music scores, many of which have been written especially for them by the Polish composer Leszek Jankowski. The exhibition by the Quay Brothers at MoMA is one of the most unique shows I have seen in Manhattan thus far. The mediums used in the documentaries and sets are so strategically placed. I definitely recommend a visit to this show before the January closing.